A creative way to make business cards stand out. 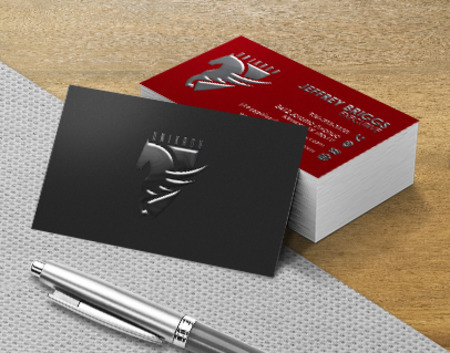 Bring your business cards to life with raised spot UV business card printing. This printing process introduces texture that can mimic the look and feel of certain products. You can also use it to bring attention to your business logo. Having that texture on your business cards can be the one feature that sets you apart from the pack. It really is a difference maker. Raised spot UV business card printing only works if it’s printed on a thick piece of paper. Our 16 pt. cardstock is as tough as they come. 16 pt. business cards are about half the thickness of a credit card. Our resilient cardstock is able to outlast ordinary, flimsy paper. Our tank-like cardstock is built to last. Your competition’s business cards will pale in comparison. Areas not covered by the spot UV coating will have a velvet lamination applied to it. It’s the perfect contrast to spot UV and will result in a silky smooth finish that’s soft to the touch. Our premium business cards are then topped off with gloss coating which adds protection against fingerprints and moisture damage. Instead of traditional raised ink thermography, we use digital raised ink printing. What does that mean for you? With the traditional method, you can only print in 1 or 2 colors. Our raised spot UV business cards can be printed in a wide range of colors. We can also print full images and not just text and logos as you would with the traditional method. Can I add raised spot UV to the whole business card? You can add spot UV up to 30% of the surface. What does the surface feel like? Rough or smooth? The surface would feel smooth which is the opposite of the traditional method. How high will the ink be raised? It will be raised by 50 microns which is about .05 millimeters thick. It’s the amount of time it would take to print your business cards excluding weekends and holidays. Shipping time is not included. What’s the difference between raised spot UV and spot UV coating? Raised spot UV applies more layers of ink to achieve an embossed effect. To make it easier for you to design and print your raised spot UV business cards, PrintPlace offers layout templates. These templates provide the right specifications to ensure your design is printed correctly. Download one of the formats below to start. There are plenty of ways to maximize the raised spot UV effect on your business cards. Here are a few. Highlight Logos – Your logo should always be the center of attention. Raised spot UV printing can shift the attention of a person to where it matters most. Spotlight Products – You can apply raised spot UV on any image including pictures of your products. Let customers get a feel of what you’re offering. Raise Minor Details – Raising ridges in your artwork makes for a completely different business card experience. You can also use the process to produce raised lettering business cards.